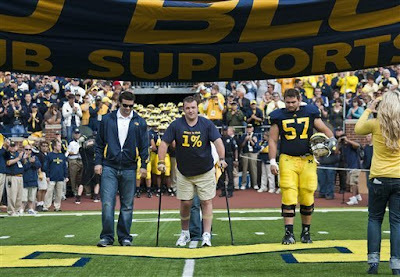 113,090 people got to witness a man who had a 1% chance to ever walk again after becoming paralyzed in a horrible car accident, lead the 2010 Michigan football team out of the tunnel and on to the field. Grab your Kleenex now. Even two days later AND after watching Denard and O-line dominate UConn, this is still the story I'll remember most from the opening game. Aside from also being the top trending topic on Twitter on Saturday, Denard Robinson has been named the Big Ten's offensive player of the week for week 1. In his first career start, Robinson set school records in total offense (383 yards) and rushing yards by a quarterback (197) to lead Michigan to a victory over Connecticut. The sophomore quarterback completed 19 of 22 passes (86.4 pct.) for 186 yards and a touchdown while sprinting 197 yards on 29 carries (6.8 avg.) with another touchdown. His 197 rushing yards are the sixth most by a signal caller in conference history while his completion percentage of 86.4 is second in school annals behind only Elvis Grbac, who completed 20 of 22 passes (90.9 pct.) against Notre Dame in 1991. Yes, we share the sentiment of the rest of the Michigan universe that Denard Robinson was absolutely awesome on Saturday, but whenever a QB looks solid and puts up numbers like that, you have to share some love to the offensive line. Those guys played one of the most dominating games I've seen a Michigan line play in at least 3 years. Its seems funny in hind sight looking back over the last 4 months since the spring game questioning who would start at QB against UConn. We all saw glimpses of what Denard was capable of in that spring game, but no one, including me, was confident enough to tell themselves that he could actually be that much improved over 2009. 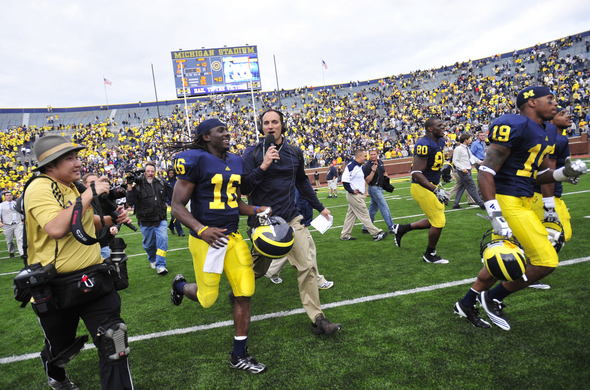 To break down 2009 Denard vs 2010 Denard...in all of 09, Denard was 14 of 31 for 188 yards, 2 TDs and 4 INTs. Against UConn, he went 19 of 22 for 186 yards and 1 TD. At today's presser, Rodriguez was curious (jokingly of course) about where all the QB controversy questions went. 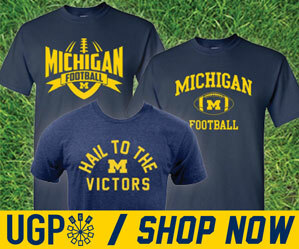 Any questions about Denard's passing have been answered. Bring on the Irish.